July | 2014 | "It's fruitcake weather!" I’m not usually one to reference specific books directly but Start With Why by Sinek spoke to me. It speaks of leaders with power and those who lead by inspiring. It speaks to those that desire to inspire and those seeking inspiration from others. Perhaps the most fantastic part of it all is realizing how the most influential people leading communities and organizations all share the talent that tells us the “why” of their presence in our lives. If we take a moment to consider inspiring leaders, not once do we envision a 30-minute powerpoint presentation packed with specific information nailed down to the nitty gritty details of their ideas. Instead, we recall the board–inspirational statements–they make that celebrate the very driving ideals that give us the reason to believe and recall it when we wake up the next morning. Not once did you favourite author have to tell you “I write great books”. They let you know that their written work is valuable by challenging the norms of a supposedly saturated industry. No one will ever be motivated, nor care enough, to be part of a community that only preaches on how well you do one thing. There is a reason people thrive on inspiration. Because it can model both our personal lives and organizations we run. 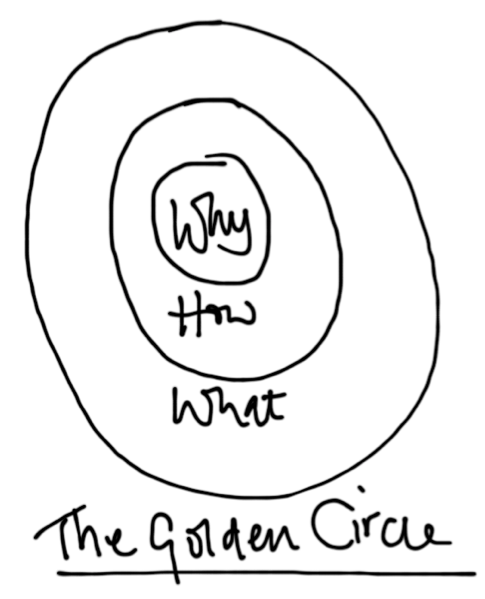 Sinek developed the Golden Circle as pictured above. Just as I spoke of inspiration, the Golden Circle encompasses both people and their business interactions. In short: It doesn’t matter how good you are at what you do–people won’t care unless they know “why”. Is this really applicable to our lives you might ask? Fair question. I thought the same. Last week someone asked me to map out the “why” of my life for my own personal clarification. After what felt like hours of talk, I realized I still had no understanding of what “why” really meant. So, here’s what I’ve come up with: Your WHY can be broad. Vague. With lack of details in fact. All it has to be is something that drives you to continue moving forward every morning. My why in this case is to inspire through written communication. To enable people to find their own place in the world–whether this be a mental state of well-being or a physical home. We are people of change and growth. Our actions will shift its course as we move forward but our “why” is what will remain consistent.